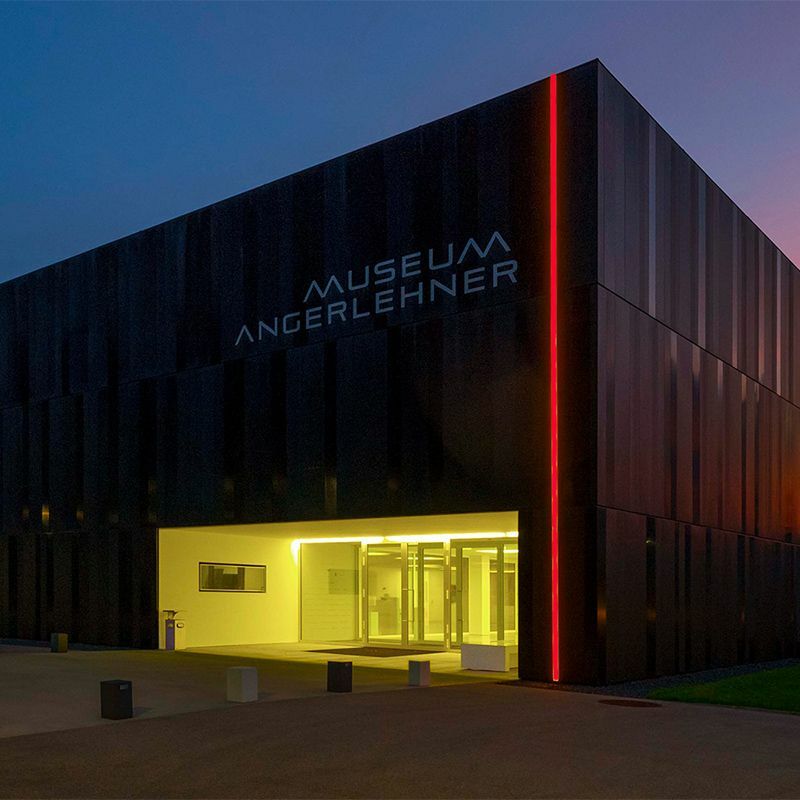 The privately run Angerlehner Museum in Thalheim near Wels was opened in September 2013. It presents the private art collection of KR Heinz J. Angerlehner, which grew and developed over 30 years of passionate engagement with contemporary art. The focus of the extensive collection is on painting from 1950 onwards, supplemented by drawings, photographs and sculptures. The works are housed within black and white buildings, the first of which presents a shimmering black metal façade to our visitors. The impressive 1,200 m² exhibition hall is one of the largest column-free exhibition rooms in Austria and is, alongside various other rooms, available as an event location. The new museum building grew out of the former workshops and assembly halls of the company FERRO-Montagetechnik (FMT) which the founder of the museum established and managed with great success for almost three decades. The relocation of the industrial plant to another site provided the opportunity to establish the museum in the former factory. The intensive planning and construction phase of just three years was preceded by an anonymously organised architectural competition in which 16 international architectural firms participated. The Wolf Architektur in Grieskirchen was the clear winner of the contract awarded by the top-class jury and was entrusted with the challenging reconstruction of the museum on the banks of the river Traun in Thalheim. The quality of the architectonic solution lies in the spatial interconnection of industrial resonance and new artistic use. All wall and ceiling surfaces, installations and fixtures were painted in matt black. This clearly defined basic structure formed the backdrop for white fixtures which were positioned freely so that these neutral museum spaces stand out against the existing hall space. Thus the character of the former industrial location was preserved and the history of the building remained recognisable. The exterior of the private museum presents itself in the form of a black iridescent metal façade. This architecturally clearly compartmentalised and spacious museum building meets all the functional requirements of a modern art museum: an extensive entrance area, six exhibition rooms of different sizes, an outstanding viewable storage area, an imposing events hall, a large, bright room for art education activities, seminar rooms and a small café on the ground floor. These publicly accessible facilities are flanked by a spatial and functional programme specially designed for the museum as well as the latest security, air conditioning and lighting technology. 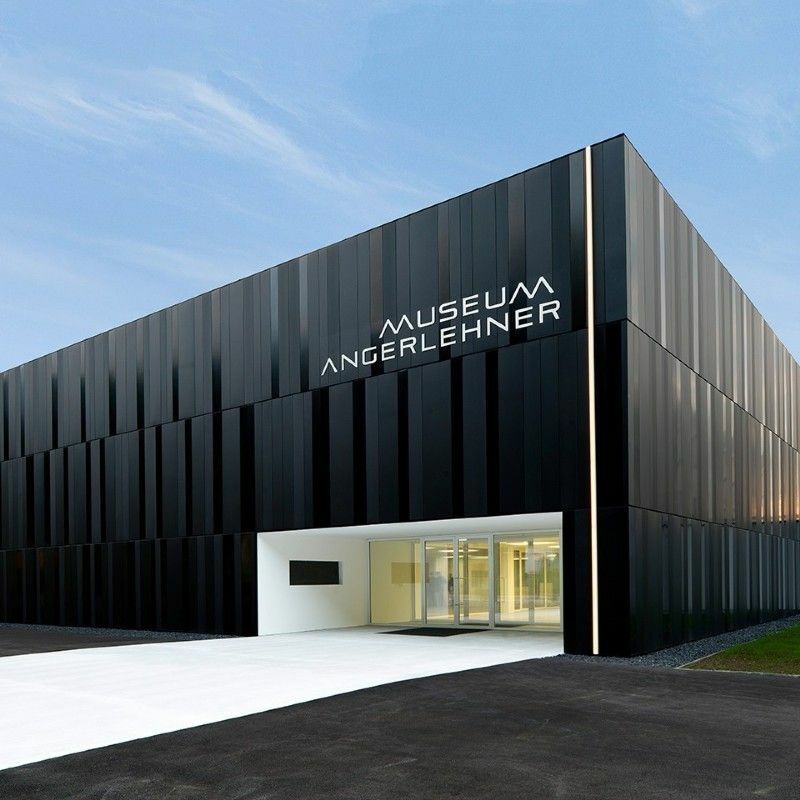 The Museum Angerlehner has several different exhibition areas offering art imposing and spacious scope for development. The light, air conditioning and security technology are state-of-theart and fulfil all current guidelines and standards for exhibitions and international loan agreements. 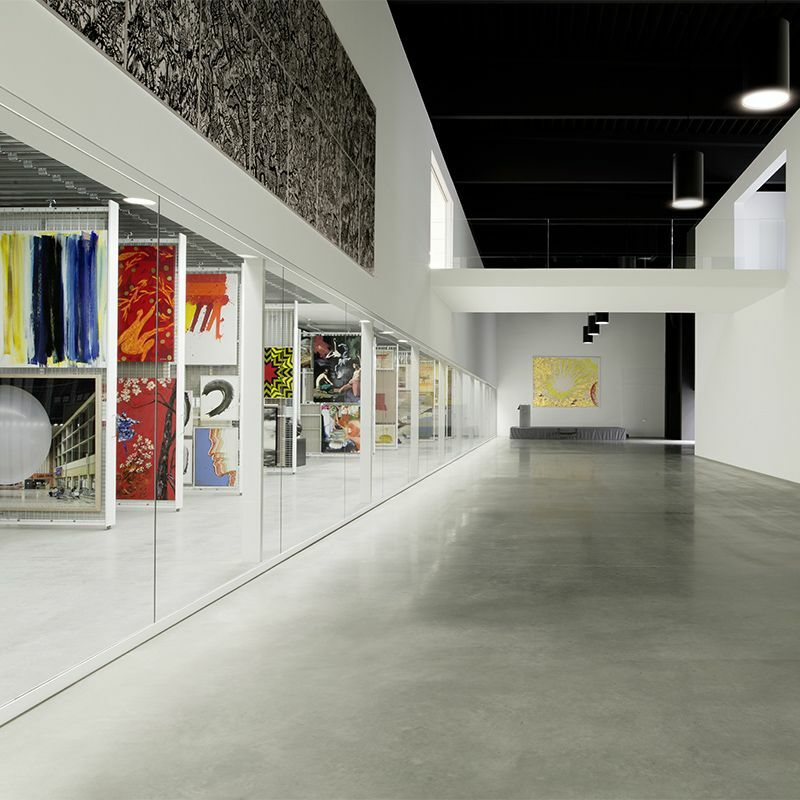 This room which is some sixty metres long and twenty metres wide offers an exhibition surface of 1,200 square metres, thus constituting one of the largest pillar-free exhibition halls in Austria. It impresses with its clear forms and interconnecting spaces with deliberately designed openings offering views and vistas into the upper storey as well as the events hall and the viewable storage area. At the north-western end of the exhibition hall there is a large picture window offering a view of the natural surroundings. The skylights located at a height of some ten metres together with the daylight provide a pleasant atmosphere and optimum lighting conditions. 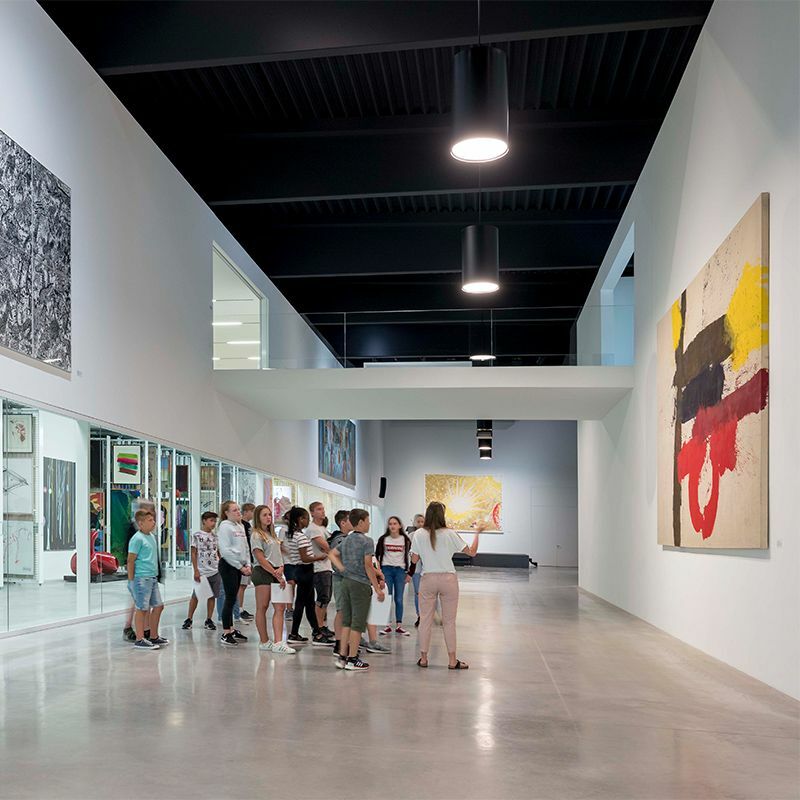 The distinctive architectural concept becomes particularly noticeable in the exhibition hall: while the old parts of the former factory and assembly hall were painted in black, the new art museum installations are recognisable as white architectural features. A 10-ton indoor crane, preserved from the inventory as an indication of the former production facility, is a true eye catcher thanks to its yellow colour. It still functions and is used for the museum operations and for events. Above the large exhibition hall are two gallery rooms in the form of a bridge, each with an exhibition area of 200 square metres. These are particularly suitable for solo exhibitions. Openings offer views of the museum areas below. Just as in the hall on the ground floor, an unsealed polished concrete floor and indirect ceiling lighting are responsible for the special atmosphere of the room. The gallery rooms with a height of 4.55 metres are slightly higher than the graphics rooms which is why there is space here even for larger works. On the upper floor two rooms above the one-storey viewable storage area provide additional space for exhibiting art. Together they provide more than 400 square metres of exhibition surface and were specially designed for the presentation of graphic, photographic and video art. Here, primarily smaller-scale works are exhibited, in particular sketches and (printed) graphics, but also sculptural works. To ensure that the works of art can be displayed to the best possible effect spotlights are used for a focussed view of the art orks. The layout of these rooms and the high-quality parquet flooring create a feeling of intimacy appropriate to the works shown here.